Salsa Recipe – This restaurant style salsa recipe is easy to make in minutes! No cooking required for this fresh, delicious homemade salsa recipe that you can adjust the heat to your preference! This homemade salsa recipe has totally spoiled me. You see, I’m one of those people that you have to watch closely when you go to the local Mexican restaurant with me because I’ll eat more than my fair share of the chips and salsa. The chips are great and all, but really, they just serve as a vehicle to get the salsa into my mouth as quickly as possible. So, making this restaurant style salsa recipe at home allows me to keep friends and family in my good graces! 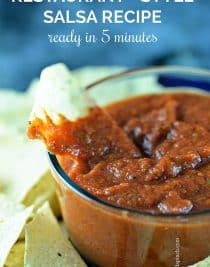 Since it makes a fairly large amount of salsa in just a few minutes with ingredients that I normally have on hand, I can whip it up in a minute’s notice. It couldn’t be any easier to make either. I just roughly chop the onions, garlic, and peppers, toss into my blender or food processor, give it a whirl and voila, salsa! Super simple and oh so delicious! 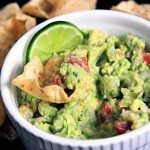 As simple as can be and a no-cook salsa recipe that everyone loves! While you can eat it immediately, the flavors tend to meld together if you allow it to sit for about 15 minutes. For that reason alone, I recommend making it a little bit before you plan to serve it because seriously, who can wait to eat salsa?! You can adjust the spiciness and heat of your salsa with the peppers. I suggest beginning with one jalapeno pepper that has been deseeded and the membranes removed and giving it a taste. The one pepper, depending on how hot that pepper is, will make a mild salsa. For more heat, add another pepper or leave in the seeds for even more. The seeds are where the real heat is in the pepper! For my family, I generally use two jalapeno peppers and only a few seeds, but you’ll want to adjust to your own preference. 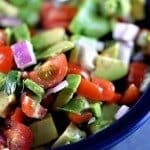 Here’s my oh so easy restaurant style salsa recipe. Make it soon! You’ll love it! 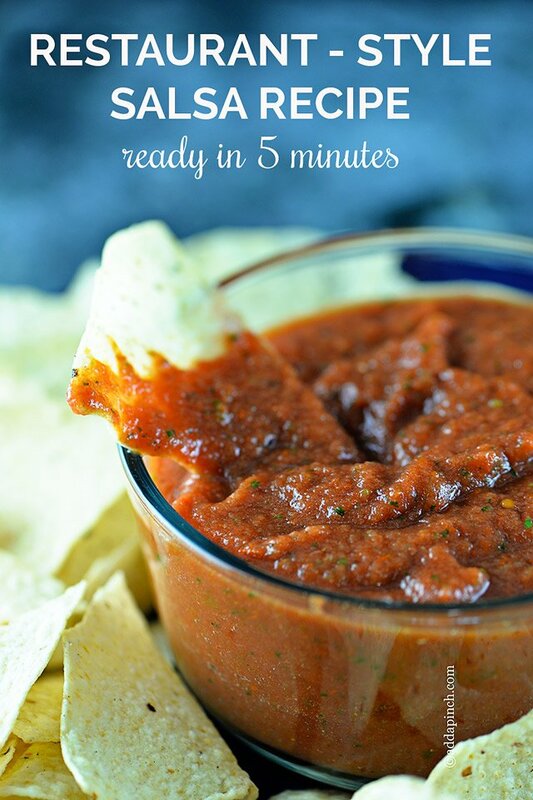 This salsa recipe is easy to make in minutes! 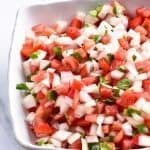 No cooking required for this fresh, delicious restaurant style salsa recipe that you can adjust the heat to your preference! 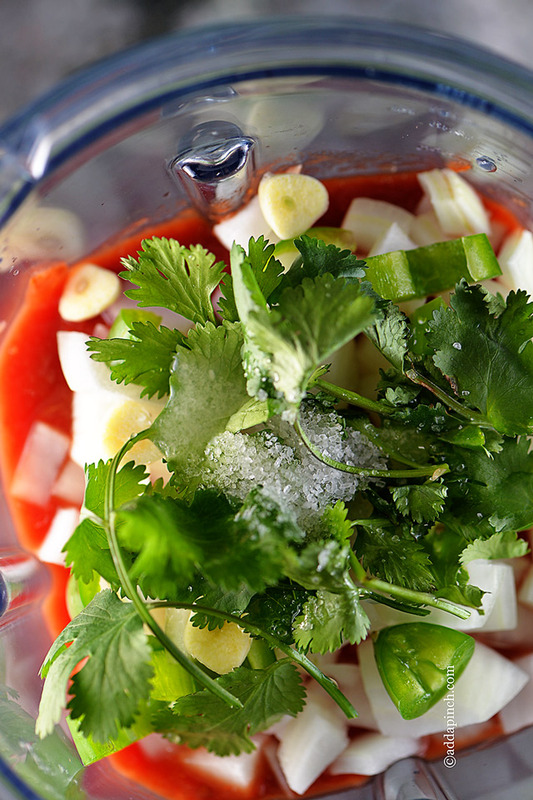 Add all ingredients to the container of a food processor or blender. Pulse until well-combined and it reaches the consistency you prefer. 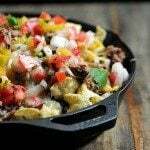 Best when you allow the flavors to combine by letting the salsa rest about 15 minutes before serving. Store any remaining in an airtight container in the refrigerator. Adjust the heat of your salsa with your jalapenos. Deseeded jalapenos will be much milder than those where the seeds and membranes have been included. Begin with 1 jalapeno that has been deseeded and the membrane removed and then adjust based on your preference for taste. 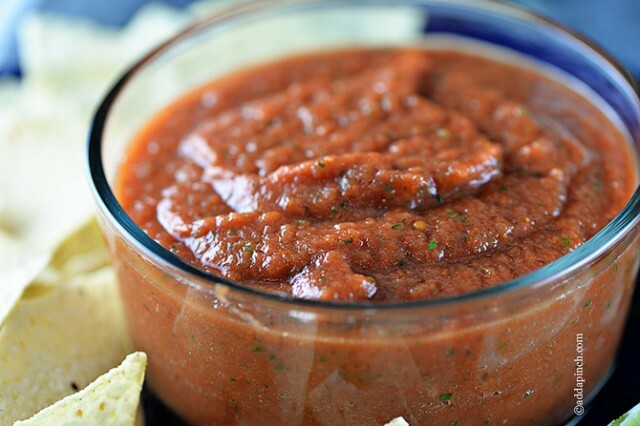 Store homemade salsa recipe in an airtight container in the refrigerator for up to 7 days. Use 1 teaspoon Stone House Seasoning in place of fresh garlic, if desired. Looks delicious! I’m a red salsa lover. I usually ask for double the salsa when I sit down at a Mexican restaurant. Now I’m crazing it! Great recipe! You sound like me at a Mexican restaurant. I actually pour the salsa over my rice and in my taco. Love the stuff. You know I’m pinning it! I just fell in love again. 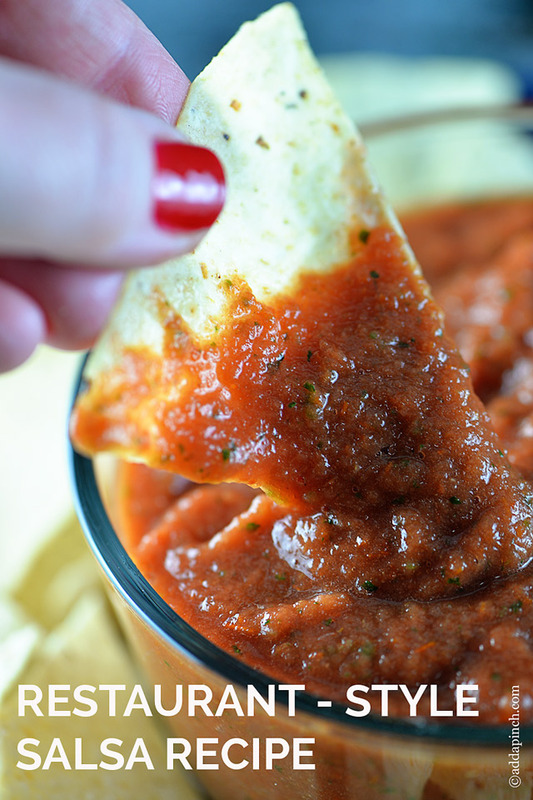 OMG, but this salsa recipe is the answer to every question!!! Made this tonight, it was AWESOME! Husband even commented on it and said it was great and that’s rare! 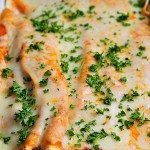 How easy and yummy and I LOVE THIS!!! Thanks so much! I’m so glad you both loved it, Denise! I could happily settle into a bowl of this with some warm tortilla chips…looks amazing Robyn! Thanks Aggie. I think we need to set a date. I’ll bring the salsa, you bring the chips. Making this again today. I could drink it!!! So easy and it’s so good!!!!! I have just discovered you, like today. Hello Add a Pinch, goodbye Foodnetwork. Going on TV, aim for a PBS channel! Nothing beats a good salsa! Thanks!! I have made this salsa many times. It is truly delicious and my family loves it.I leave mine a bit lumpier. If it doesn’t get eaten up right away (mine’s usually gone not long after I make it! 😉 ) – it should be stored in an airtight container in the fridge for up to around 5 days. I tend to eat more than my share of the salsa as well. This looks delicious! We just finished our first batch and making more tomorrow, everyone in our family loved it ! The way I control the heat is by roasting my peppers first. If you use raw, the longer it sits the hotter it gets. By using roasted peppers, for some reason it stabilizes the heat so the 5th day tastes like the first. That sounds delicious. I usually make a salsa with canned and fresh tomatoes plus the lime “my children love the lime more than I do”. I think I will try this because mine is great, but not quite (restaurant) tasting. if i want to used fresh tomatoes… how mucha i have to put in it?… is the same..? You would want to use the same ratio of tomatoes, so yes, about 28-ounces or 3 1/2 cups. I hope you enjoy it! I made this Sunday and it was sooo easy and delicious. I usually buy my salsa from a local restaurant but no more; this was just so much easier and better! I always thought it was a long drawn out process; so Thank you. I made this on Sunday and it was so easy and delicious. I usually buy it from a local restaurant because I thought making salsa was a long process but no more; this was way better. So Thank you! This is outstanding. My family’s new favorite salsa. This sounds wonderful; am going to make it later today. Do you think this recipe can be used to process in a water bath canner? I would love to make it with the great tasting summer tomatoes and have it all year.